Atroll is another name for Ken St. Andre, that’s me. I’m using this site for random blogs, mostly on items that entertain me, but sometimes just about me and my life. You wanna find out about my life–look me up on wikipedia. 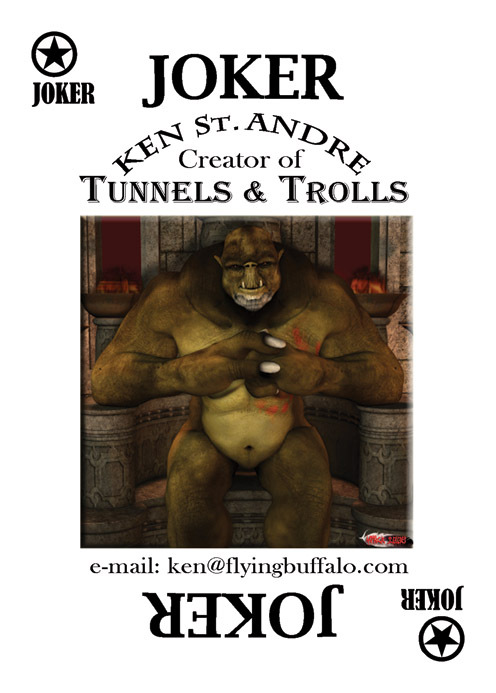 Troll God are you going to post the pictures you took at TrollCon III? Very entertaining, Ken – I read the Swarf World piece and went very nostalgic about my very first game experience – in Trollstone Caverns and how on edge i was, how desperate to do the right thing and just survive – I was sucked in by a vorpal’d vacuum. Viva New Zealand – it’s going to be like Jumping Jack said – a gas! Ken, it’s been ages since I visited Trollhalla. Can’t seem to locate it. I really should invest in Spot Hidden when I level up next. I recently scored T&T Deluxe in softcover from my FLGS. Sadly until recently I’ve had very little freetime to read it. Snippets here and there. I love that you sprinkled optional rules and tweaks throughout the book. Color section rocks my world as well. Is some version of Trollhalla still open and out there somewhere? Trollhalla went to Valhalla early this year and hasn’t been a functioning website since July 2015. Come join on Facebook. I have a Trollhalla there. Thanks for doing the blog! I can now vicariously get my REAL gaming nerd on, cause I’m too busy for anything with writing and have to satiate the rest with online gaming… which isn’t the same.